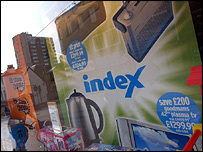 Union leaders have welcomed plans to redeploy 3,000 staff at the Liverpool-based Index stores chain. Littlewoods announced it was closing its 126 stores and cut up to 3,200 jobs on Tuesday. Littlewoods managers said they would redeploy workers within its business empire at a meeting with officials from the shopworkers' union, Usdaw. Usdaw national officer, John Gorle, said the meeting, on Thursday, had been "very positive". "The good news is that the company have given a real commitment to redeploy as many Index staff as possible within the Littlewoods empire from home shopping to their high street stores," he added. "The other positive development is that Argos has agreed to give Littlewoods details of their job vacancies across the UK so Index staff at stores where there is no buyer can consider real opportunities in the biggest catalogue shopping chain." "We've also been approached by other major retailers looking to make contact with the highly trained Index staff to offer them employment which is another option for our members." Usdaw (Union of Shop, Distributive and Allied Workers) has also sought permission for access to Littlewoods to see whether the decision to axe the chain was justified. A spokeswoman for Littlewoods said: "We will do our utmost and look into all the different possibilities for trying to redeploy our staff."